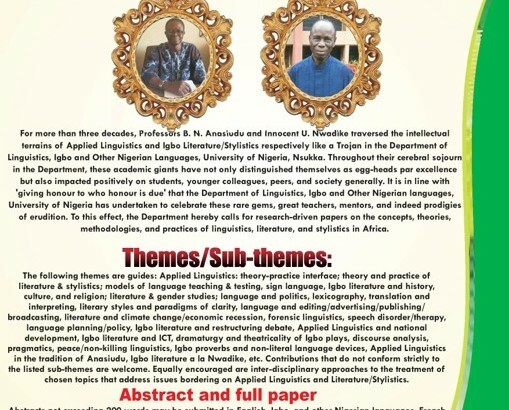 Literature: Festschrift in Honour of Professors Bennett N. Anasiudu and Inno U. Nwadike. Please, send an email attaching your manuscript directly to: hod.linguisticsandnigerianlanguages@unn.edu.ng, george.iloene@unn.edu.ng or olusanmi.babarinde@unn.edu.ng. Submission deadline: 1st March, 2018. See the attached call for papers for more information.